Good people! I’m flying in and out to show off a rather smashing new suit I was sent by the splendid people at Puttin’ on the Ritz. This new reproduction clothing label is based right here in Blighty, and everything they produce is made to measure and handsewn on these fair isles. The lovely Andrea, who is in charge, is a fan of this blog, and she got in touch to ask whether I’d be interested in modelling their forthcoming ‘Spying for the Allies‘ suit. I didn’t need to give that question a lot of thought, before I replied with an effusive affirmative, accompanied by lots of exclamation marks! The design of the suit was itself something of a mystery, though it was described to me, and I saw a fabric swatch, so I knew it would be rather special. And when it arrived, dear readers, special it most certainly was. Have a look! The deep green wool seemed to call out for some very 1940s colour matching, or rather, should I say, colour contrasting. Red 1940s platform shoes from Remix vintage, some red nappa leather gloves and a reproduction hat (with huge feather) I snaffled from a friend gave it an appropriately autumnal look, I felt. As you can see, the suit is beautifully cut, with a sweetheart neckline, generous peplum, and fitted straight skirt, which features a fishtail drape. I did a shoot with a friend (these photographs being taken by my dear Dad as per), but am awaiting the results so I can show you (and indeed Andrea – sorry Andrea) the back, as well as a lovely silk blouse I also modelled. I do have a shot of the back of the jacket though! As the suit was made-to-measure for me, dear Andrea generously let me keep it, and so, Puttin’ on the Ritz now have a sponsorship spot over there on my sidebar. I hope you’ll have a look at their other gorgeous wares. My favourite is probably the Harlow gown, which would be just the thing for any fancy parties you may be attending over the festive season. Or even as a wedding dress! They also do some stunning skirts and trousers. Even options for the chaps! This is absolutely gorgeous honey! Wow! Check out my Christmas giveaway if you haven't already! love the hat! it looks a bit like one that i kept looking at in a vintage shop nearby, until once day when it wasn't there anymore. i must say that suit is so beautiful ! I love it. I take a look on this shop right now… You're a temptress Fleur ! Its amazing!!! WOW. You're so lucky to be able to try these things before any of us 😉 Beautiful. Beautiful picture and outfit! You are gorgeous. How completely and utterly fabulous. It looks stunning on you! Absolutely gorgeous outfit, and that hat is fabulous! O__O What a stunning suit! I just adore the cut of the jacket, and the peplum to too divine… Love it! I love a peplum suit! I have a vintage brown wool with ivory fleck suit that has a large peplum. It makes the waist look smaller and is flirty over the hips. That one is wonderful! It's so beautiful and it looks really well made. And like in all other comments I must say that I adore the hat. Hi Fleur! I love your suit, it is soo stylish. Soo beautiful!!!! Hope you enjoy your week! I've been looking at their site – it's so great to see someone doing lots of 30s repro. I'm thinking of a Trip Down the Nile blouse. You look gorgeous in that suit! What a glorious outfit! Off to check them out now. You look fantastic as always!! Looking forward to some words from Mr. Wax as his Bounder product is remarkable. You look extremely elegant. I wish I had such fabulous long legs! the feather is such a nice touch!!! I love the detail at the back and the line of the buttons. The hat is fab too! wow do you so fancy and beautiful! what a great suit! Gah, I love your style. WOW…That suit is absolutely GORGEOUS!!! Lovely items on the website, more things to put on the dream list. so dita von teese looking!! oohh Fleur! You look amazing! I'm going to check the shop! Oh, I adore this — really special. Fleur, this suit is absolutely perfect for you! You look stunning! Hello! I'm new here, but I must say I love you blog already! You're so beautiful, you look like a movie star! Your style, your hair, your make up – everything is just so immaculate. You're so classy and brave at the same time. Thanks you for posting these great photographs! Absolutely smashing dear! Delores very nearly swooned at the sight and Vivienne is most taken with that rather dashing hat. Wowza!!! I love your blog, so, I jsut gave you a blog award! Go to my blog to see it! But, I know you probably get them all the time! This suit is FABULOUS!!! 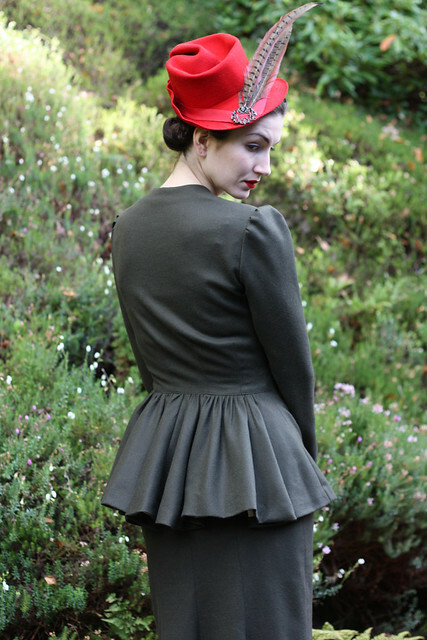 I adore the peplum, and it looks stunning on you. Oh wow Fleur, what a fabulous suit! It is just beautiful and would be bought immediately if I were slightly more blessed on the pennies front! Amazing, and you look rather dapper in it with that charming hat! This Fleur, is gorgeous. I wish they were in Canada or I was in England. Not only is this suit brilliantly constructed the way you chose to create the outfit combines two of my most favorite colours on earth. Red and Black. That hat is incredibly great. Love this outfit! I saw these pics at my hair parlour, in a magazine 🙂 very nice! You didn't happen to notice which magazine the pics were in, did you? We'd like to have a look ourselves! Thanks also to everyone for all the lovely comments about the Spying for the Allies! You are my new goddess!!! I've only perused this blog but its brilliant! But I do have a question…. I am doing a play in my community theatre. A radio play. Its set in the 1940's and I am playing the announcer. Yes I know that a woman announcer would have been rare if not impossible but I'm hoping to live up to it. What I LOVE to know is where I could find some tips on hairstyles. I have long hair so I would love to do curls and yours ALWAYS looks great… So any advice would be greatly appreciated.